Have you ever wondered to present himself as a person of another nationality? You can imagine, for example, Chinese or Japanese? No? Then immediately take your phone and download it [sic] amazing Android-application called Make me Asian. This is just a fun app lets you indulge you and your friends! You can for a few seconds to make himself a Chinese, Japanese, Korean or any other Asians! 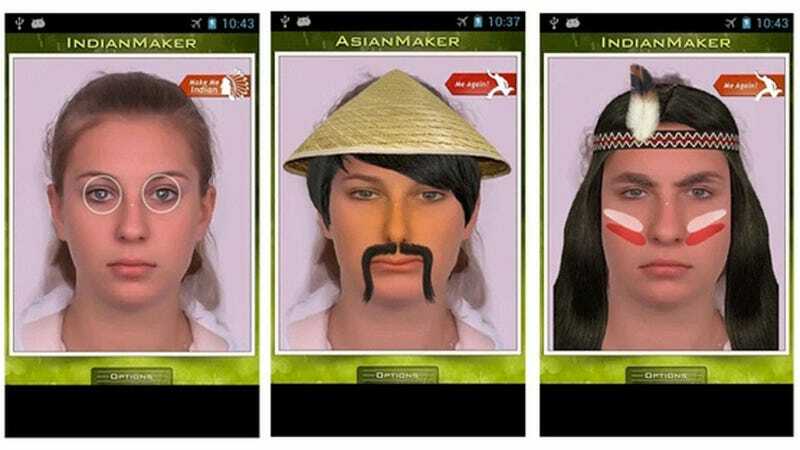 The apps allowed users to make themselves look "Asian" or "Indian" by superimposing outdated racist iconography. "These are nothing less than hateful and offensive stereotypes that are used to this very day to marginalize and humiliate people," wrote Peter Chin, who created the petition, on Change.org. As Jezebel pointed out last December, a Change.org petition was created. Over eight thousand people signed the petition. Google listened and decided to remove both apps, reports NPR. Sometimes there are those in the majority, no matter the country or the culture, who just aren't sensitive to possibly offensive iconography. Maybe they're careless or just don't know what it's like to be on the receiving end. Chin is correct in that dated stereotypes are used to marginalize and humiliate. They are. Make Me Asian and Make Me Indian were both apparently created by Kimbery Deiss. On the developer's website, there are two new offensive apps, Make Me Auschwitz and Make Me Black. A message that reads, "Coming Soon to Google Play!" Both these apps are also incredibly tacky and offensive. Blackface and the Holocaust? Really? As of posting, Kimbery Deiss, who also developed Make Me Old and Make Me Bald, does not seem to be listed on the Google Play Store. Kotaku attempted to contact Deiss via the email address listed on the developer's site, but that email address no longer appears to be active. "This may seem like a small victory, but it made an important statement: that minorities will not simply accept dated and offensive stereotypes that are wrongly foisted upon them," Chin added on Change.org. "We stood up, our voices were heard, and something changed."